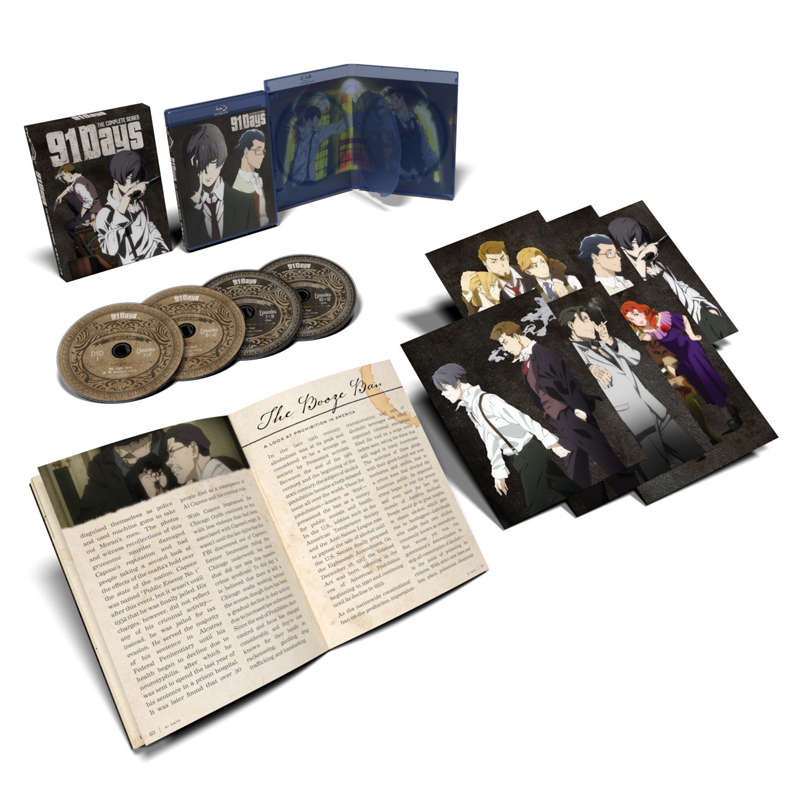 91 Days Limited Edition contains episodes 1-12 + OVA episode plus a 40-page companion guidebook (with artwork, character profiles and background information on Prohibition, the Chicago mafia, period firearms, and more), a collector's rigid box featuring artwork from the series, and a set of six art cards. Prohibition—a lawless era where bootleggers prosper and mobsters prowl. Avilio Bruno has grown up alone in this murky world after the Vanetti's murdered his family. One day, he receives a letter that holds the key to revenge. Befriending the don's son, Nero, Avilio works his way through the Vanetti family and sets his vengeance in motion. "Revenge is a dish best served cold", this quote sums up this anime perfectly. 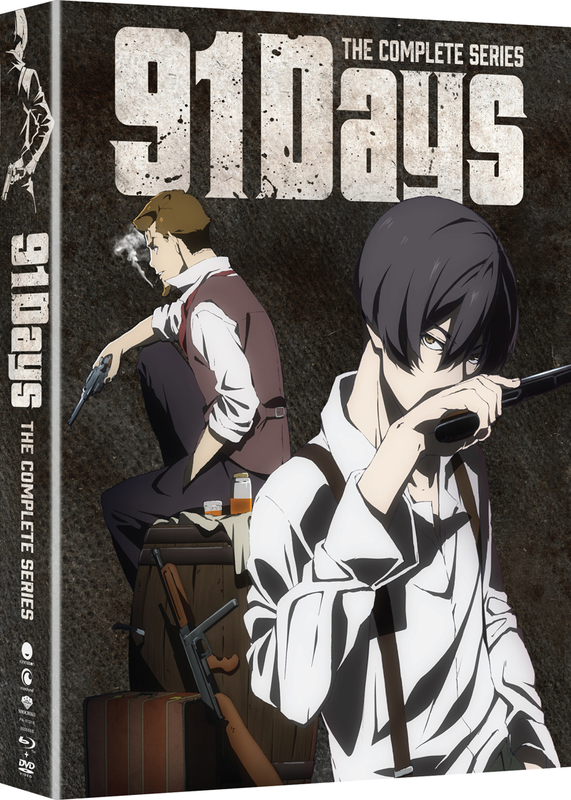 91 Days takes place during the Prohibition era, in a town called Lawless. It's the story of protagonist Angelo Lagusa and his quest for revenge against the Vanetti Family. This anime is really good and I'd recommend it to anyone who likes 1920's gangster, mafia stories. This Blu-ray and DVD set comes with a 40 page art/ guide book (which fits in the box with the blu-ray and dvd). The one downside to to this set is the six art cards. While they are nice they come in an envelope separately that doesn't fit in the box. But other than that it's a great anime and this is a nice box set. This anime is in my top five animes I’ve ever seen. If you haven’t seen it and like revenge or mob stories you have to see it. The world is fleshed out well for a 12 episode anime, all of the characters are very interesting and the way the story twists and turns is breath taking. I could gush about this series for hours. This anime captures the spirit of the time period so well, and the English voice actors put on such a captivating performance. The box is a very nice look, with a somewhat distressed leather look. The only complaint is that for those who haven’t seen or finished the anime, there’s a huge spoiler(although very neatly placed) on the inside lip of the box. But it’s honestly a very cool touch with the “handwritten” style. Overall a great addition to my collection.